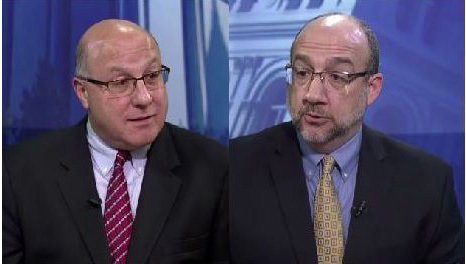 Albany veterans, strategists and pundits Steve Greenberg and Bob Bellafiore will provide insights and prognostications for what will be the most interesting year in state and national politics since at least 2015. The presentation will take place on Wednesday, February 10 at the National Register-listed University Club, 141 Washington Avenue at Dove Street in Albany. Albany Roundtable luncheon meetings are open to the public. Steven Greenberg is the founder and principal of Greenberg Public Relations, and has more than 30 years of political and communications experience. His 12 years in the New York State Assembly culminated as Press Secretary for two former New York State Assembly Speakers – Mel Miller and Saul Weprin. For nine years, he was Communications Director for former New York State Comptroller H. Carl McCall. Steve appears weekly on “The Insiders” segment on Capital Tonight, which airs nightly on Time Warner news stations across New York. He also appears regularly on “New York Now,” a statewide PBS public affairs program. Reservations are required and seating is limited. The cost for the luncheon is $20, which may be paid at the door. The Roundtable also offers its guests the option of paying in advance with a credit card at www.albanyroundtable.com. The University Club will serve a hot and cold buffet from 12:00 noon to 1:00 p.m., with the program commencing at 12:30. Reservations for the February 10 luncheon are required by Tuesday, February 9 and may be made by prepaying online, by calling 518-431-1400 (the Capital Region Chamber) or by sending an e-mail to albanyroundtable@yahoo.com.